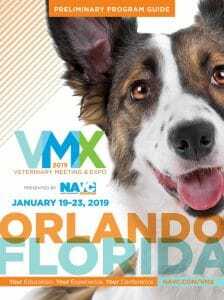 At VMX: Veterinary Meeting & Expo 2019, you’ll choose from sessions focused on aquatic, behavior management, dermatology, equine, exotics, farm animal, infectious disease, orthopedics, parasitology, pain management, practice management, small animal dentistry, small ruminants, surgical techniques, veterinary acupuncture, veterinary nurse tracks, health & wellness and MORE at the world’s largest veterinary event. To enhance your learning at VMX, sign up for one of these Hands-on Workshops, Rounds (formerly Masterclasses), Meet the Professor Luncheons or Behind the Scenes Tours. These experiences offer something a little above and beyond the traditional VMX program tracks. Perfecting today’s specialized procedures takes practice, and you’ll get plenty of that at these hands-on learning sessions. VMX provides a seasoned instructor and all the tools, supplies and space you need. Arrive ready to roll up your sleeves and get to work refining your techniques. Tight on time, but still want to freshen up or learn a new skill? Choose the Hands-on Workshop-ONLY registration when you can’t fit the entire conference into your schedule. Join top practitioners as they share how they managed their most unusual or challenging cases in these 2-hour sessions. Groups are limited to 30 registrants to allow for free-flowing discussions. Even the field’s most respected leaders have had their skills put to the test. Both enlightening and intimate, this long-standing NAVC tradition lets you break bread, swap stories and share strategies with leading clinicians and like-minded colleagues. In just 90 minutes, you will gain insights and make connections that can enhance your practice for the long run. Limited to 30 registrants per class. From swimming side-by-side with gentle manatees to getting up close and personal with sea turtles and otters, these exclusive tours offer rare glimpses into animal care on the wild side. Limited to veterinarians and/or veterinary nurses/technicians and their families, unless otherwise noted. VMX offers more than 1,200 hours of continuing education credits. An attendee may obtain as many as 41.5 credits by taking advantage of the full slate of scheduled sessions offered over the course of the 5-day conference. For more information, contact RACE at +1.877.698.8482 or visit aavsb.org/race.